As a runner, whether amateur or professional, it is highly likely you will experience pain in the bottom of the foot at some stage in your running life. In most cases, this will turn out to be a symptom of plantar fasciitis, an inflammatory condition that can interfere with your training and affect your performance. The good news is that arch tendon injuries don’t need to spell the end of your favorite sport. If caught early, plantar heel pain, as well as the other symptoms of plantar fasciitis (inflammation, stiffness, reduced range of motion) can be addressed through a number of treatment solutions, most notably targeted physical exercise. 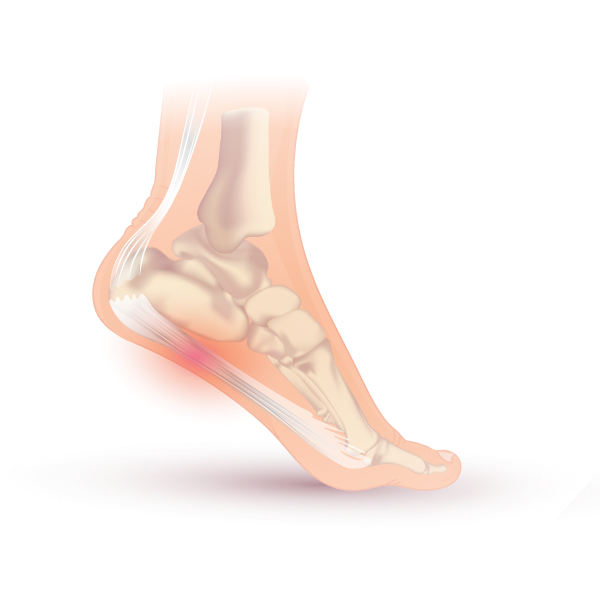 plantar fasciitis is a medical condition that is caused by repetitive stress on the plantar fascia, a fibrous band of muscle connecting the heel bone to the front of the foot. The increased tensile load creates excessive pressure, which in turn, leads to inflammation and pain. Over time, micro-tears can occur in the tissue, adding to the severity of symptoms. For one thing, it can present difficulties or stiffness when standing or walking, especially in the morning. Why is plantar fasciitis so common in runners? People who are active or who spend a lot of time on their feet are the candidates most at risk for developing this condition. For example, excess strain on the plantar fascia is extremely common amongst both professional and amateur runners, and is often seen in conjunction with stress fractures. The plantar fascia plays an essential role in foot movement, in that it absorbs the shocks produced by various activities like walking or running. This is why pain and inflammation will usually occur after intense training. Often the pain and stiffness will decrease after warming up, only to reoccur once the training session has finished. After diagnosis, the next treatment step is to design a suitable rehabilitation plan. The overarching goal here should be to improve overall quality of life and allow the person in question to return safely to their previous levels of physical performance. However, to avoid making this too overwhelming, it is best to split it up into smaller milestones that are easier to achieve. Performing the right kind of exercises will make all the difference when it comes to reducing pain. In the vast majority of cases, a specially devised exercise program is the most effective form of treatment for plantar fasciitis. This can be achieved using a combination of four different exercise formats designed to address the problem from multiple angles. During each stage of recovery, the emphasis – and therefore exercise type – should vary slightly in order to achieve the different outcomes needed for the foot to make a full recovery. During the acute period, the overriding goal of any exercise should be to reduce inflammation (active effect on inflammatory markers) and stimulate blood and lymph circulation in the area, thereby promoting healing in the damaged tissue area. Don't let the pain stop you from achieving your goals. As recovery progresses, the emphasis of rehabilitation shifts away from simply relieving symptoms to actually getting to the root of the problem and preventing it from recurring. Training outcomes should now include: improving range of motion, reducing stiffness and strengthening the muscles that support the foot arch. Contributing factors, such as a shortened Achilles tendon, can also be addressed at this point. Injurymap is a highly useful application that can help you to treat both the symptoms and the causes of plantar fasciitis safely and effectively. It offers a series of complete training programs developed by experts to meet all of your injury needs at every stage of your recovery journey. The great thing is that it allows you to take full control of your rehabilitation and go about achieving it, all from the comfort of your own home. For more information about plantar fasciitis and a preview of the exercises used to treat it, download the Injurymap app, via the Apple and Google app stores. This concludes our article on how to deal with foot pain as a runner. We hope that you found it helpful and that it will help you succeed in combating your foot and heel pain. Don't forget to share this article with friends, family, or on social media if you found it useful.